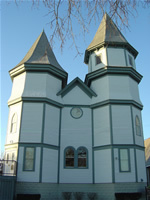 The Twin Towers Chapel is located in the Old Orland Historical District at 9967 West 144th Street. From LaGrange Road and 143rd street, drive West 1/2 mile to West Avenue. Turn left (South) on West Avenue, and proceed to 144th Street. Turn left on 144th Street. The Twin Towers Chapel will be on your right side, just East of the Methodist Church. Ample parking is available on the East and South side of the Chapel. Click on the map to interact with the map and get directions from your address. The Old Orland Heritage Foundation is a not-for-profit, non-denominational group of volunteers dedicated to preserving Orland Park's historical resources, especially in the Old Orland area. Since the group's founding in 1987, OOHF's major project has been restoration and management of the historic Twin Towers facility. Funds for the restoration work come from membership dues, rental fees, corporate donations and other fund-raisers. Much of the labor has been done by OOHF volunteers. We are so happy that we were able to have our marriage ceremony at the Twin Towers. What a beautiful Chapel. The Chapel was our choice because of the history and the feeling of family when you walked in the double doors, it was absolutely perfect! The wedding coordinator for the Chapel was very helpful. She paid close attention to details that we would have never noticed, Thank you! We toured the Twin Towers Chapel and thought that it would be the perfect place for us to renew our wedding vows.